Raise money for your 4-H Club, Sunday August 26th! The Greene County Farm Bureau is teaming up with Greene County 4-H and Germain Ford to host a Ford Drive for the Future Event on August 26th from 1-6pm at the Greene County Fair. At this time, Germain Ford will give $20 per test drive to the Greene County Farm Bureau up to $3000 to put toward the scholarships they give out to students annually. We need 4-H’s help to get people there so the 4-H club and FFA chapter that gets the most people to drive on their behalf will get $250 for their club/chapter. The local 4-H Clubs will also be having a car wash competition to see who can raise the most money through donations for their club. The fairgrounds is letting us use the livestock wash areas so it should be a great time for the kids. The winning 4-H club who receives the most donations will also receive a free pizza party for their efforts. 4-H Clubs are responsible for their own supplies but if your club is interested in participating please fill out the link to register. All Clubs are welcome and must be registered by Saturday, August 25th at noon. If you have any questions please reach out to Greene County Farm Bureau’s Organization Director, Ashley Rose at arose@ofbf.org. We can’t wait to see you there. Greene County Cattlemen’s Club will have food available for purchase and Greene County 4-H will be giving out ice cream. This is not a sales event and there will be absolutely NO pressure to purchase anything. We just wanted to find a way to be an active partner in the communities that we call home! Thank you to Germain Ford for making this event possible! We still have pizza order forms here to pick up. 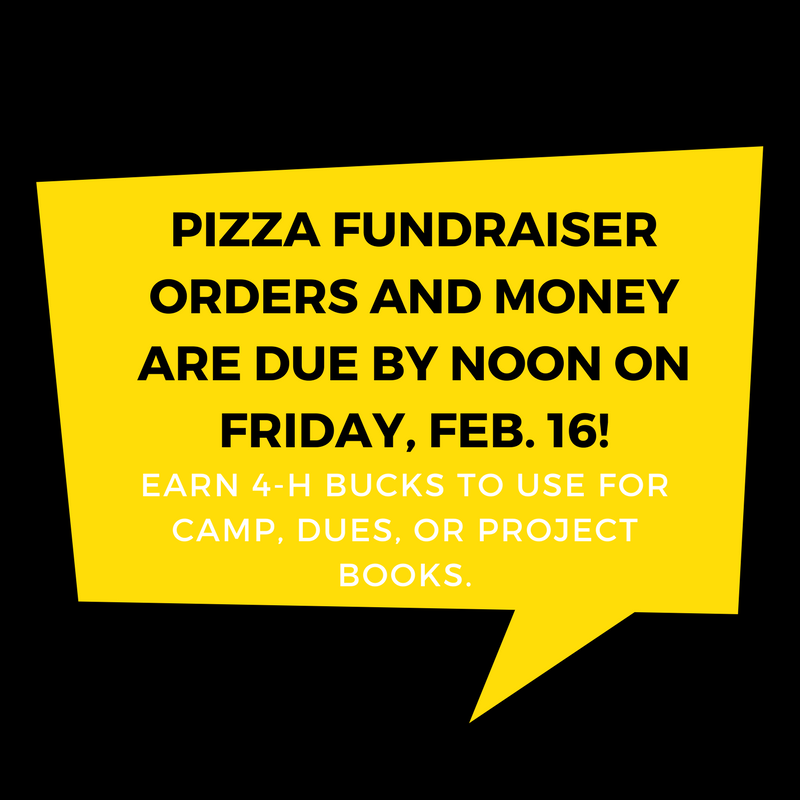 All orders and money are due back to our office by next Friday, Feb. 16 at noon. Youth earn 4-H bucks to use in our office for their county dues, project books, or camp. This is a great opportunity to help youth and our 4-H Advisory Committee. 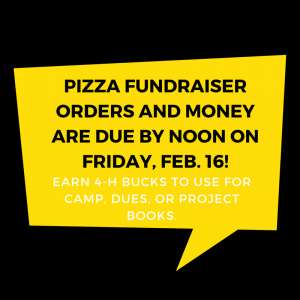 Pizza pick-up is March 2 at the Extension Office in the Buckeye Room. Let’s see how much the 4-H Advisory Committee can sell. The committee would love to sell $10,000 worth of items. Please help make this happen! !